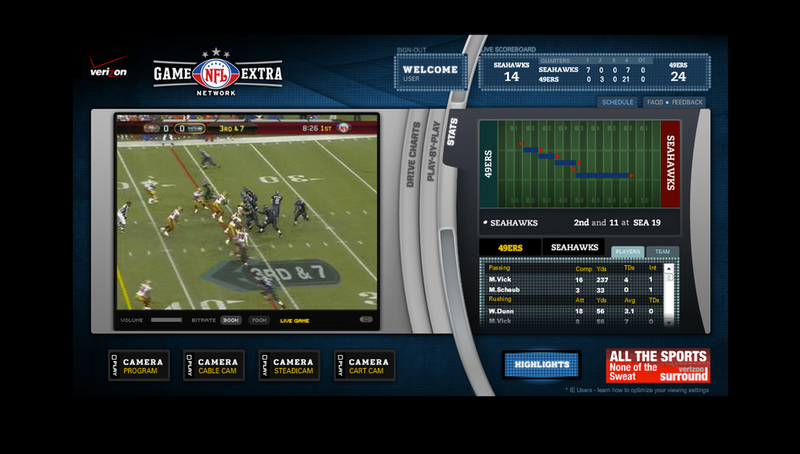 Tackling Live Stream Broadcasting for Verizon and the NFL. Verizon needed to up their game to win new subscribers for their FiOS broadband service. As lead sponsor for the NFL it had access to an immense audience. And a very big idea: let FiOS-enabled NFL fans view live primetime games online. Verizon turned to Questus to make this goal a reality. 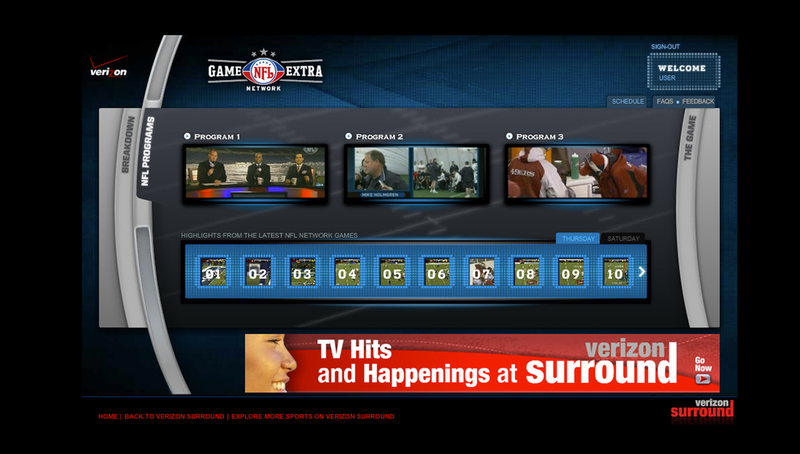 NFL Game Extra was a multitiered, immersive, interactive experience. Users called the shots with six user-controlled camera angles of the players and the field. They had immediate access to stats, drive chart simulations, video highlights, and the ability to chat live with other Game Extra viewers. The project required cool collaboration skills, super tech smarts, and speedy reflexes. Questus worked hand in hand with Verizon; the NFL and its divisions; CBS Sportsline to coordinate the live stats; and British Telecom, plus other hosting providers to provide access to NFL Game Extra from anywhere in the world. A strict, multi-tiered logical back-end recognition architectural plan needed to be implemented as well as a value-added acquisition pipeline for non-FiOS TV customers to provide immediate service upgrades and game-time access. And it all had to be ready in time for kick-off on Thanksgiving Day– just a mere five weeks from the initial project kick-off. Whew! NFL Game Extra ran every Thursday for the duration of the season; the experience was so successful, it was repeated the following year. Verizon more than met its goals of increasing FiOS subscriptions. And the NFL broke new ground for the future of live streaming pro football.